Donny Schatz battled past Kyle Hirst and forward from a fifth place starting position at Brad Sweet’s Placerville Short Track Outlaw Showdown presented by Riebes Auto Parts Wednesday night to score his fourth World of Outlaws Sprint Car Series victory of the season. Schatz’s win came as the series returned to the track for the first time since 1992. Schatz and his Tony Stewart/Curb-Agajanian Racing team are one of only three repeat winners of the 2015 season. A crash dominated the middle portion of the feature and brought out a prolonged red flag. The lap 21, chain-reaction incident caught up several drivers including Jason Johnson, Daryn Pittman and Kraig Kinser. Johnson was taken to an area hospital following the crash. According to Johnson’s wife Bobbi, the rookie of the year contender is alert and talking to doctors. Doctors are still evaluating Johnson’s injuries and will know more information in the coming days. Pittman climbed from his car under his own power but was taken to an area hospital for further evaluation. Kinser was OK and able to finish the feature. A spectator was also transported to an area hospital for further evaluation following a separate incident the lap before. Jason Sides and Andy Forsberg initially held the front row for the night’s 35-lap feature. When it came time to take the track for the feature however Forsberg was late to staging and was penalized and moved back to the next row. That shifted Kyle Hirst’s HAM Construction car to the front row with Sides. When the green flag flew, Hirst battled past Sides before the two reached the back straight, with a surging Forsberg taking over the second position. For the next five laps, Hirst and Forsberg battled for the lead. A red flag flew on lap five after Tanner Thorson flipped in the middle of turns one and two. Thorson was OK.
Another caution flew on lap eight, with the front of the field largely remaining static. By lap 15, Hirst began catching the back of the field. As Hirst looked for a way around the lapped car of Justyn Cox, Forsberg saw an opportunity. Through the next several laps, Forsberg searched high and low looking for a line around Hirst, with Cox as the pick. Even after Hirst cleared Cox, the battle between he and Forsberg continued with the two even making contact at one point. Through it all though, Hirst maintained the lead. Schatz also used the lapped traffic to his advantage, battling past Sides on lap 19 coming out of turn four for the fourth position as the two worked their way through. Following the open red flag on lap 21, Schatz battled past Forsberg to take over the second position. He then set his sights on Hirst for the lead. Hirst bobbled coming off turn two on lap 27, which gave Schatz an opening. He passed Hirst as the two drivers came off of turn four to complete lap 28. A red flag and two cautions came late in the race. Ultimately, the final caution setup a green-white-checkered finish. On the final restart, Forsberg fell off and gave up the third position to Sides’ East Coast Logistics car. Hirst maintained his second place perch and was unable to catch Schatz. Forsberg ultimately finished the night in seventh. 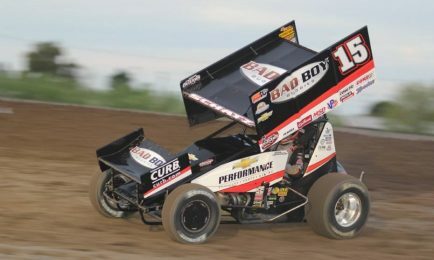 It was the third win for Schatz during the Outlaws’ California swing. It was the first podium finish of the season for both Hirst and Sides. The World of Outlaws Sprint Car Series returns to action this weekend at Calistoga Speedway for the Wine Country Outlaw Showdown.